You know why you need to ditch your annual employee performance review. But, if you’re working at an organization that’s stuck in its out-of-style performance management ways, you’re probably struggling with the how. No worries. We’ve provided you with a resource that will help you join the 85 percent of highly engaged organizations that have ditched their employee appraisal reviews for ongoing, engaging one-on-one conversations. 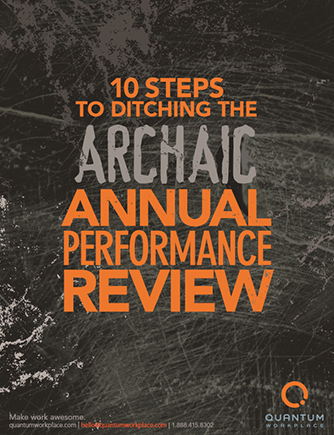 Download this ebook for 10 easy steps to ditching the dreaded annual performance evaluation once and for all.